Surface tension is a contractive tendency of the surface of a liquid that allows it to resist an external force. The cohesive forces among liquid molecules are responsible for the phenomenon of surface tension. 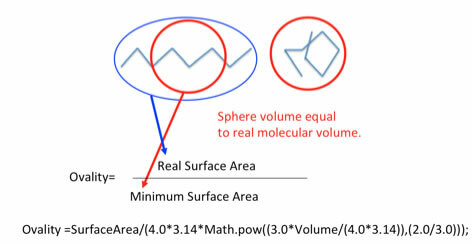 In the bulk of the liquid, each molecule is pulled equally in every direction by neighboring liquid molecules, resulting in a net force of zero. The molecules at the surface do not have other molecules on all sides of them and therefore are pulled inwards. This creates some internal pressure and forces liquid surfaces to contract to the minimal area. Which index do you use to do that? We know that oil float on water. That is cause to lower density of oil than that of water. But we also know even aluminum metal float on water with the effect of Surface Tension. 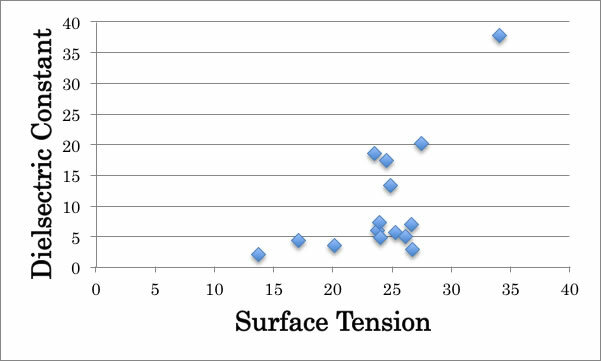 So we tend to think water-soluble liquids have high Surface Tension. 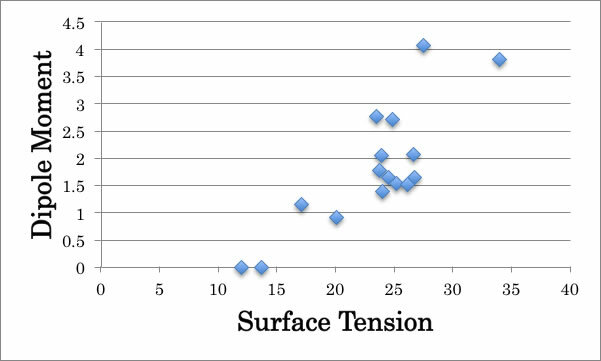 But you can easily find out it is wrong if you plot Surface Tension to log Solubility to water. You may use Dipole Moment or Dielectric Constant to assume Surface Tension. It may work but not perfect. There is no exact index, so we use very ambiguous word “Hydrophilic” and “Hydrophobic”. Hydrophilic compounds have high Surface tension and hydrophobic compounds have low Surface tension. Is that correct? 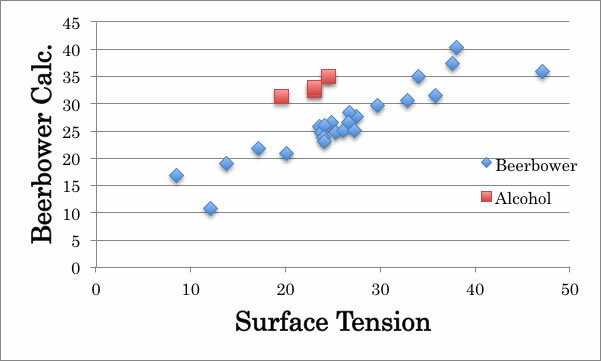 It seems OK if I plot temperature dependence of surface tension. Hydrophilic liquids such as Amide, Alcohol come to upper line and hydrophobic liquids such as Ether come to lower line. So it is not so bad idea, but problem is what the definition of that words. Even though I admit Amin functional Group (NH) is hydrophobic, how we can explain the difference of Diethyl amine to Pyrrolidine or Pyrrole. Ring NH is hydrophilic Functional Group, Ring NH next to double bond is much hydrophilic FG. How many type of NH should I determine? So I can’t determine functional group contribution to Surface Tension. 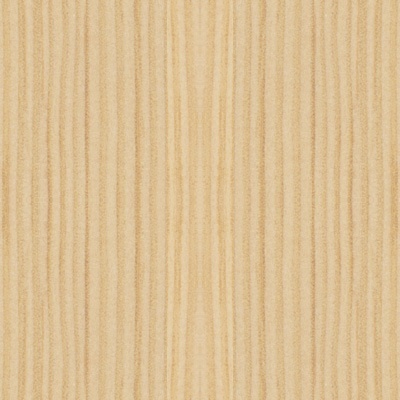 Even more, there is molecular shape effect. Beerbower (1971) propose very efficient scheme to predict Surface Tension. This scheme is very good for large molecule, but if I apply for C4 molecules, result is not so good especially for all alcohol compounds. 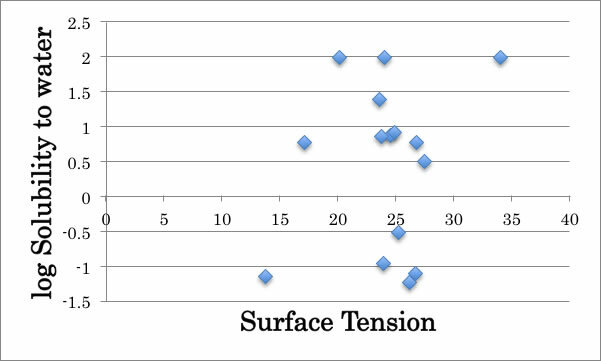 So one of the best indexes to think of Surface Tension is Hansen Solubility Parameters (HSP). But all Alcohol becomes exception. You may think of this comes from hydrogen bonding effect, but n-butylic acid is not exception. The original force of HSP is Heat of vaporization (Hv). Almost all case, the experimental measurement of Heat of Vaporization is done at boiling point. The result is most stable at there. But Hansen Solubility Parameters use Heat of Vaporization at 25℃. We use the Watson rule to do this. 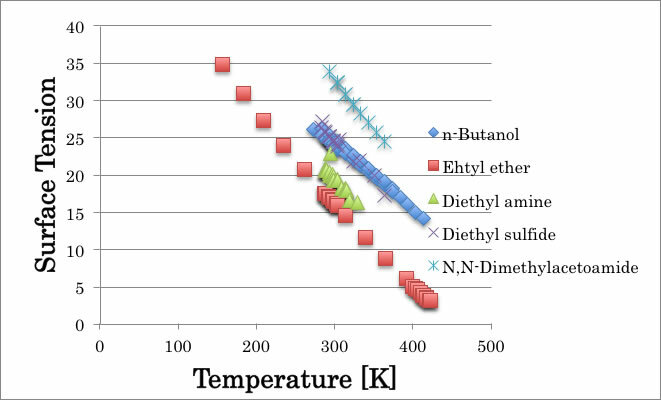 So if you know Hv@BP BP and Tc, then you can calculate dHv2 : Heat of vaporization at Reference Temperature. From where, 0.375 power index come? How accurate this rule is? 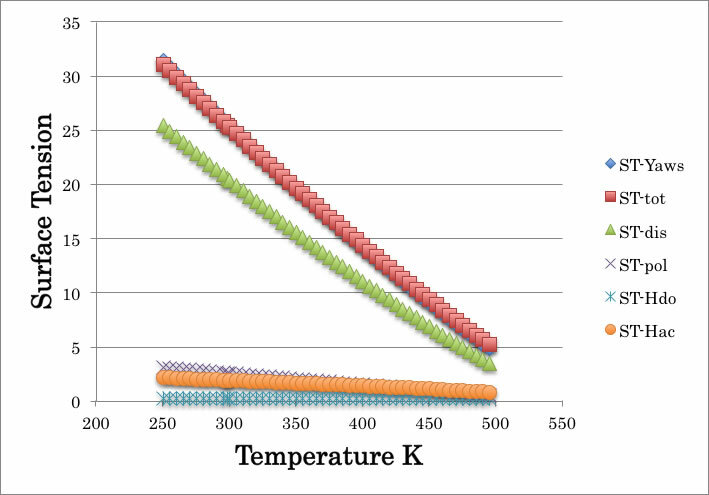 If I plot temperature to Heat of vaporization, I will get below chart. The curves are very dependent to compounds. 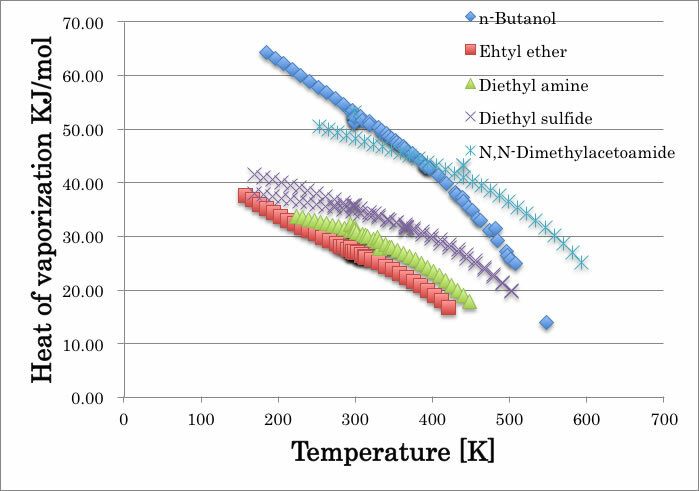 n-Butanol case, it loose hydrogen-bonding force as to elevate temperature, so Hv energy is sharply down. Other curves are almost parallel. And at critical temperature, all Hv become zero. 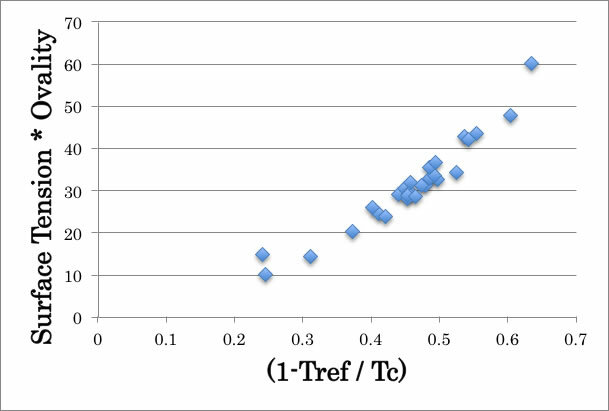 And what Watson rule said is change X-axis term temperature to (1-T/Tc). 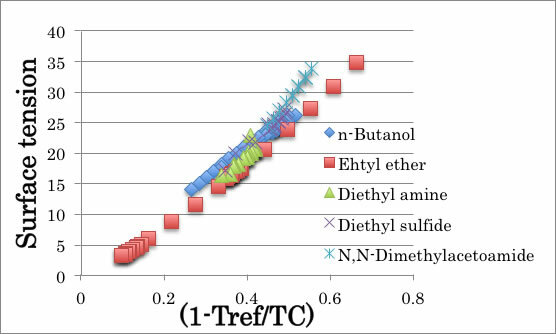 And the curve fit, for example, diethyl sulfide’s curve power index become 0.3528. 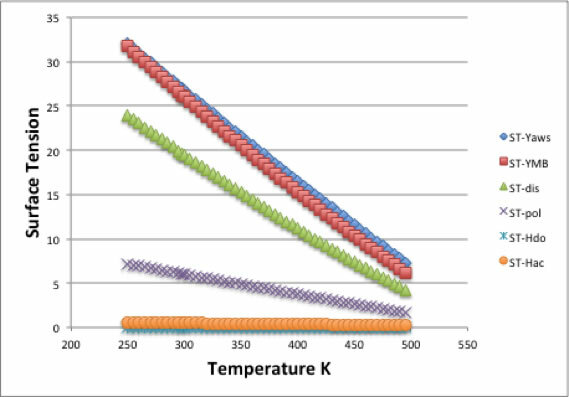 So, the 0.375 power index in Watson scheme is average of these curves (except hydrogen-bonding compounds). Surface Tension case, it also become zero at Critical Temperature. 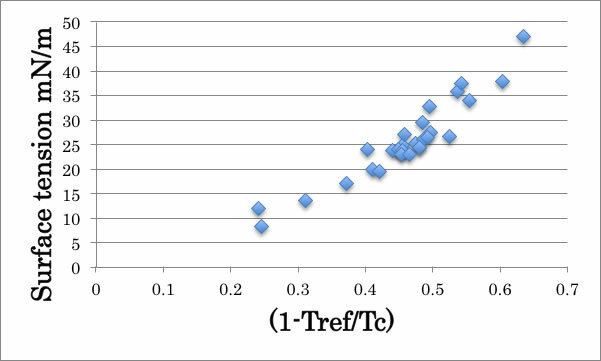 So plotting with (1-Tref/Tc) is effective. Different from Heat of Vaporization, Hydrogen-bonding compounds are not became exception. 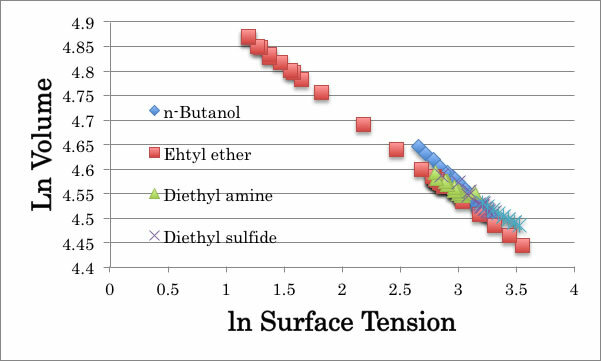 What this chart said is that Surface tension of liquids are determined by only Tc (Critical Temperature). The higher Surface tension means reference temperature is far from Tc. Fluorinated carbon has very low surface tension because Tc is low and near to room temperature. 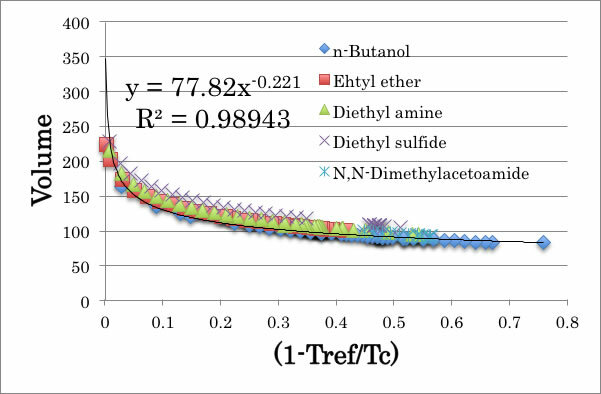 We always based Surface tension at 25℃, but if we based (1-Tref/Tc), there is no difference “hydrophobic”, “hydrophilic” or “hydrogen-bonding” compounds. I got the very good scheme to estimate surface tension for every kind of compounds at any temperature. This help to calculate Marangoni Number. Now atom effect is canceled, I can think of shape effect. This Ovality effect increases the correlation. In the Beerbower paper (1971), I found very interesting scheme. This scheme is derived from Macleod – Sudgen scheme. 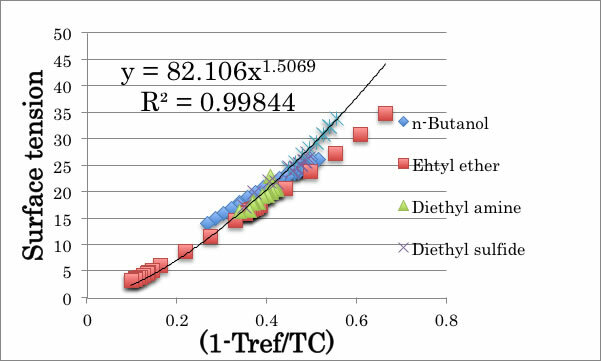 If I use temperature, the curves are dependent to type of molecule, so I use (1 – Tref/Tc). 82.106 and 77.82 are almost same, so from 2 curves, I got the equation. ln γ = -7.0 * ln Volume + Const. And I got good agreement. Macleod – Sudgen scheme, the temperature dependency is introduced only by density change by temperature. And this Parachor is temperature independent property. The Parachor and Molar Refraction[RD] has very good correlation. 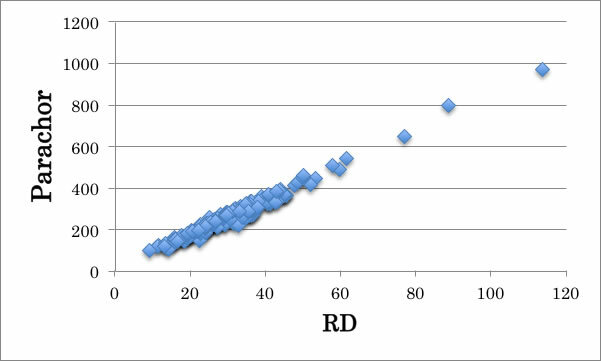 We found that to estimate Molar Refraction[RD], HSP play very important role. Please refer to Estimation of Refractive Index article. With all these results, I built Hansen type 4-dimensional surface tension estimation scheme at any temperature. Hydrogen bonding terms become very low value even for alcohol because “hydrophobic” or “hydrophilic” nature plays nothing to surface tension. 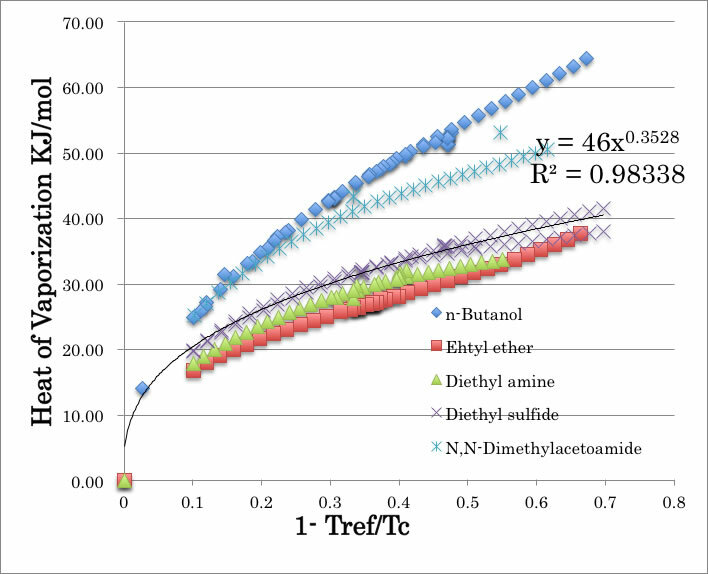 This is the great difference from Hansen Solubility parameters (HSP).